When federal elections were held on September 24, 2017, the CDU/CSU won32.9% of the vote, its worst electoral result in nearly 70 years. The SPD won 20.5%, its worst-ever showing. The AfD won 12.6%, to become the country's third-largest party in the German parliament. The election results showed that more than a million traditional CDU/CSU voters defected to the AfD. In a sign that concerns over mass migration are not limited to conservative voters, the center-left SPD lost 500,000 voters to the AfD while the far-left Left Party lost 400,000 voters. In addition, nearly 1.5 million first-time voters cast their ballots for the AfD. This trend has continued, as consistently corroborated by opinion polls since the 2017 election. The mainstream parties are fighting back with what some observers say are underhanded measures, aimed at delegitimizing — and possibly criminalizing — the AfD, including by calling for the party to be placed under state surveillance. Calls for the AfD to be monitored by German intelligence have intensified in recent days, after members of the AfD participated in mass protests in Chemnitz against spiraling migrant criminality — protests in which approximately 50 hooligans and neo-Nazis were also present. The protests erupted after a 35-year-old German-Cuban man named Daniel Hillig was stabbed to death on August 26 by two migrants during the city's annual festival. Police initially refused to reveal the identities of the perpetrators, but on August 27 a police report was leaked on social media — the document has since been scrubbed from German websites but it remains on a Russian site — which showed that the killers were illegal migrants from Iraq and Syria. Both had extensive criminal histories but were allowed by German authorities to roam free on German streets. Police later confirmed that the leaked document was authentic and said that they had opened an investigation into suspected "violation of official secrets." 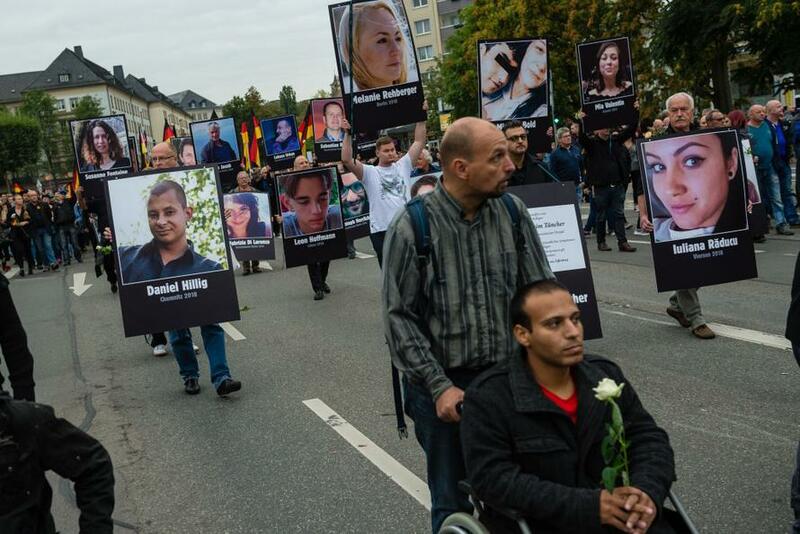 Thousands of people took to the streets for several days to protest the killing and the inaction by German authorities over the issue of spiraling migrant crime. The protests (and counter-protests) brought together a broad spectrum of German society, including supporters of the AfD, as well as members of the so-called "far-right scene." Near the end of one of the marches, some of the protesters turned violent and began insulting some migrant passersby. That incident then shaped the media narrative from one of Germans protesting migrant crime to one of far-right attacks on innocent migrants. Few if any of Germany's mainstream politicians condemned the murder of Hillig, but they were quick to denounce attacks on migrants. On August 27, government spokesman Steffen Seibert, in a national press conference, condemned the "hunting of humans of a different appearance, of different origins" on the streets of Chemnitz. Chancellor Merkel echoed: "We have video footage about the fact that there were hunts, that there were riots, that there was hatred on the street, and that is unacceptable in our constitutional state." It later emerged that all of the government's allegations were based on a single 19-second video — titled "Hunting for Humans in Chemnitz" — which was posted on YouTube and later broadcast by the public television channel ARD. The video shows one individual chasing another in what appears to be an isolated incident. Moreover, a protester who grabbed national headlines by making a Nazi salute at the Chemnitz protest was discovered to be a left-wing extremist who infiltrated the march in order to discredit it. But the media narrative had been set in motion. "There is a small right-wing mob in our country that will take its violent fantasies of civil war to our streets. That in the Bundestag [German parliament] a party applauds these excesses against foreign fellow citizens as legitimate self-justice, shows that the majority of our country must become even louder when it comes to rule of law, democracy and cohesion in our society." Bundestag Vice President Thomas Oppermann demanded that the AfD be monitored by Germany's domestic intelligence service, the Office for the Protection of the Constitution (Bundesamt für Verfassungsschutz, BfV): "The refugee question divides society and the AfD rides ever more radically on this wave." German Interior Minister Horst Seehofer (CSU) countered that he sees no basis for monitoring the AfD. On the sidelines of a closed-door meeting of the CSU in Brandenburg, Seehofer defended the Chemnitz protesters: "Just because people protest, that does not make them a Nazi." He added: "Migration is the mother of all problems." Saxon Prime Minister Michael Kretschmer (CDU) later contradicted the government's claims: "There was no mob, there was no hunting down of people, there was no pogrom in this city." Saxon Attorney General Spokesman Wolfgang Klein added: "After examining all of the material available to us, there was no hunt in Chemnitz." "I will not have a semantic debate here over a word. Of course, if the Attorney General's office says so, I take note. However, it remains that a video shows how people of foreign origin were chased and how they were threatened. It remains true that there were statements that were threatening, close to the call for vigilante justice. So, in my opinion, there is nothing to talk about." "We saw pictures that very clearly revealed hate and the persecution of innocent people. One must distance oneself from that. That is all there is to say." "'There was no mob, there was no hunting down of people, there was no pogrom in this city.' Saxon Prime Minister Michael Kretschmer (CDU) clearly corrected the almost hysterical and false reporting of countless leading media outlets on the events in Chemnitz after the deadly stabbing. Even the chancellor and her government spokesman had, as we all know, conveyed these false reports to the public, and thereby giving them publicity. "For long enough, many citizens from all walks of life have noticed that the problems of integrating even third- and fourth-generation immigrants have grown bigger, not smaller — especially among Turks. The mass immigration of the past three years, under the banner of 'the right to asylum,' has significantly increased the fear of parallel societies, of crime, and of cultural alienation. "Extremism cannot be combated with exclusion, but with looking at the facts. Those who want to reach concerned citizens must themselves get out of the ideological trenches."